Presenting the turntable with the heaviest standard production platter, at 47kg. 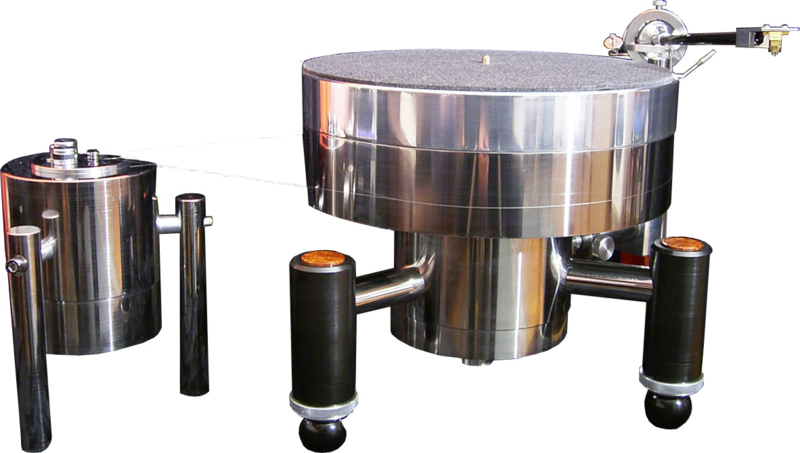 THE MASSIVE MONUMENTAL PHONOPHANT TURNTABLE ................ .
With the qua;ity of our Audio Aero, we needed a vinyl playback sysyem , that could develop the qualities of analogue further in the competition of A v D.. In the Rossner turntable we have a solid and powerful base, using a dual aluminium oxide bearing, one of the hardest materials known to man, offering only one microscopic point of contact for perfect pole rotation. The platter is made from an open sandwich construction, one layer is soft aluminium/magnesium alloy, and the other in Iconel. It has a PLL controlled 3-polar direct current engine, inductive rotor position check, and minimal gyratory moment of inertia, adjustable speed for 33/45 with separate potentiometers. Two models are available, the GML 30 and the GML 45. The GML 30 has a 30kg platter, 25kg bearing unit and 16kg motor unit. The GML 45 has 47kg platter, 25kg bearing unit and 20kg motor unit. Any weight up to 100kg is available to special order. 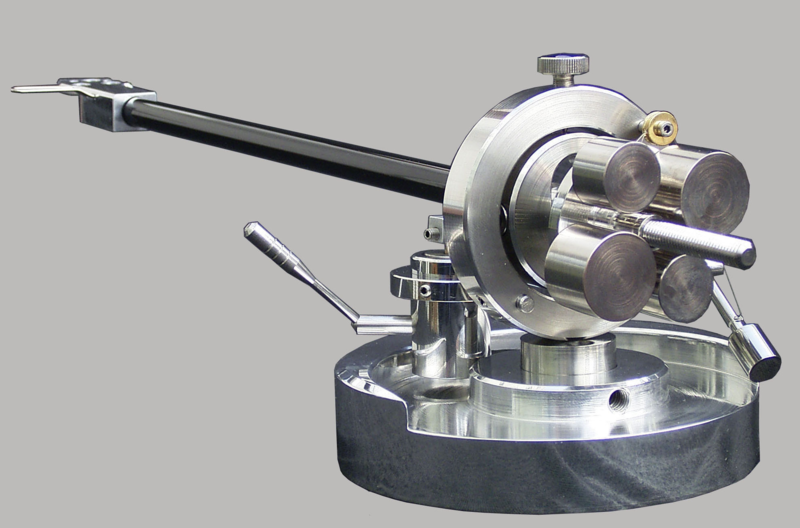 The S1 tonearm, available as SI1 with a 10 inch or SI.1.2 with a 12 inch arm has a specially developed surface-tensioned silicon oxide arm-tube and headshell in aliminium/magnesium for excellent resistance against vibration, providing detailed natuaral and dynamic sound with weight and subtlety. It features sapphie bearings, made by a watchmaker in Switzerland. The gimbal is fitted in a rotation cage of stainless steel, For anti-skating, a gravitational mass-compensation device is featured with oppositely working weights gives precise torque and is adjustable while in use. 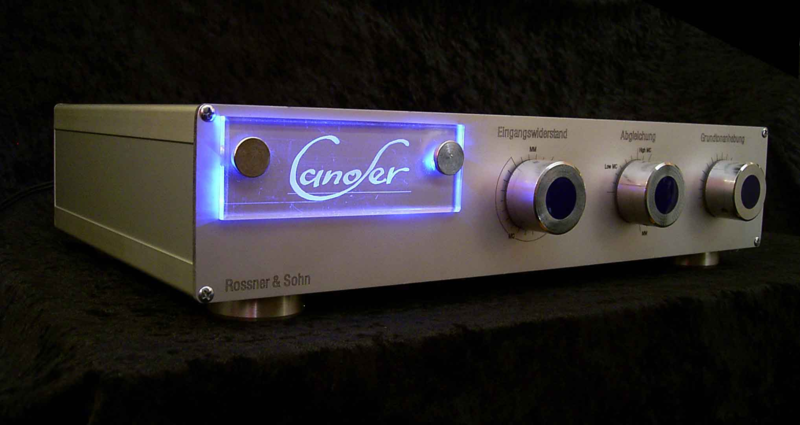 The Canofer S is equipped with Mundorf Mcap supreme and Mcap Supreme Silver/oil foil condensers, to give a more open and delicate and airy sound and an organic portrayal of the music with no loss of the dynamics. The bass foundation is more solid, mids more exquisite and highs more silky with no loss of detail. This gives an absolutely constant performance. To reduce resonances, the transformer is encased in plastic, Filtering by a nigh quality Elkos unit gives a volume of 10000 uF, the use of several condensers equalize voltage swings precisely and with ease, so that an absolutely precise votage is supplied constantly.